When your turn begins, you may pay Xcredit to place X power counters on Mammon. When your turn ends, remove all hosted power counters. If the Runner uses Dr. Lovegood to blank the text of Mammon for the remainder of the turn, does Mammon still lose all of its power counters? No. When the Runner’s turn begins, they can trigger Mammon’s ability first to put power counters on it, then trigger Dr. Lovegood’s ability to blank Mammon’s text box. It is still the Runner’s turn when “turn ends” abilities meet their trigger condition, so Mammon’s text box will still be blank, and the ability that removes the counters won’t meet its trigger condition. For an AI breaker Mannon is not bad. Assuming you know exactly how much you need to pay at the start of the turn (i.e. all the ice is rezzed and you have a plan for your entire turn) the cost to break a piece of non-AI-resistant ice is number-of-subs + strength + 1 if strength is odd. Since the per-sub cost is only 1 most of the cost comes from boosting. Common breakers like Corroder, Gordian Blade and Femme Fatale start at 2 strength so compared to those you pay 2 as a base cost. You also pay on average half a credit extra for boosting because boosting is 2 strength for 2 instead of the more flexible 1 strength for 1. AI breakers shouldn't be expected to be as efficient as the subtype-specific breakers. And if you look at the competition Mammon stands out in flexibility (no constraints on what it can break) and cost (only Wyrm and Knight are cheaper to install). The major downside of Mammon is that you have to pay for it upfront for a whole turn. That makes it an awkward breaker if there's unrezzed ice in your way. The corp may try to trick you into overspending on Mammon by refusing to rez ice. There's potential for quite a bit of mind games there, but let's not see that as a negative. All AI breakers are essentially backup breakers and if they aren't that's usually a bad sign (Faust's reign of terror). 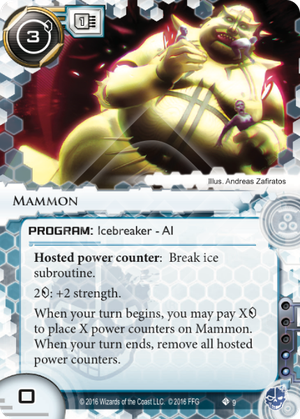 Within the realm of backup breakers Mammon is definitely one of the more accessible options. At worse you use it inefficiently by overpaying but it works everywhere an AI can and only requires normal credits, no paying with clicks or cards or anything. Because of the two influence cost and general utility I would expect Mammon to make appearances outside of the criminal faction as well. All in all Mammon is a relatively strong AI for all purposes. Just make sure you pay him enough.